Thank you with all my heart for your New Year's letter. It was cheering merely to hear from you, and more cheering still to get such a message of friendship from you and of thoughtfulness for my welfare. You may be sure that all the good wishes are reciprocated many fold. I am interested in what you tell me of Mr. Raleigh Minor's work, very much interested, but I could not venture at this time to give public sanction to any suggestion, as I am sure Mr. Minor will realize upon reflection. It is imperative that I should stand aloof at present for fear of seeming to press a matter which must be handled with the utmost delicacy and can be carried only the first pacticable step. But I will write to him about it, and am very much complimented that he should desire my opinion about his important manuscript. 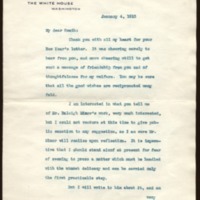 Wilson, Woodrow, 1856-1924, “Woodrow Wilson to Richard Heath Dabney,” 1915 January 4, WWP20503, University of Virginia Woodrow Wilson Letters, Woodrow Wilson Presidential Library & Museum, Staunton, Virginia.